I’m back with another card…same technique… but it’s for Jennifer’s Hope You Can Cling To Challenge at Splitcoast. Our card is to invoke a feeling of peace. I think the soft colors and butterflies definitely speak “peace”. This time I used a pale pink, medium pink and a gray. Then I overstamped it with collage image in gray. 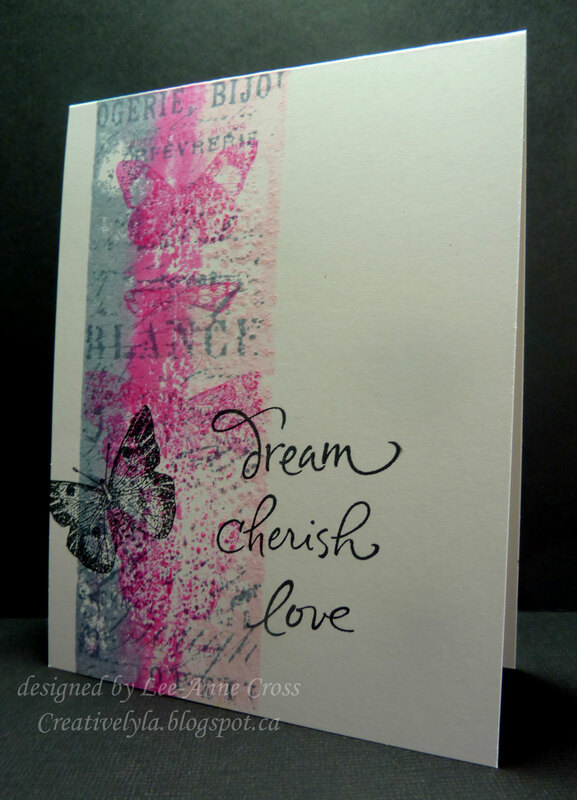 Then I stamped off the pink butterflies before stamping on the card, just to soften the color a bit. And finally the single butterfly and the sentiment in black. Thanks for joining me today my friends! Beautiful effect on this card. Love the one layer card.